2.2L (2189cc) SOHC L4 8V, 2.4L(2366cc) SOHC L4 8V. 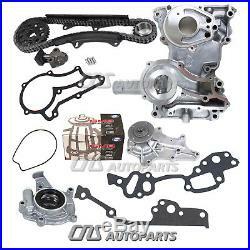 "OE REPLACEMENT" TIMING COVER CHAIN KIT w/ WATER PUMP & OIL PUMP. 78 - 80 TOYOTA CELICA 2.2L SOHC L4 8V, ENG. 78 - 80 TOYOTA CORONA 2.2L SOHC L4 8V, ENG. 81 - 82 TOYOTA CELICA 2.4L SOHC L4 8V, ENG. 81 - 82 TOYOTA CORONA 2.4L SOHC L4 8V, ENG. 1 Timing Chain (98 links - double row). 1 Cam Sprocket (36 teeth). 1 Crank Sprocket (18 teeth). 1 Left Guide Rail (straight). 1 Right Guide Rail (curved). 1 Oil Pump with Rubber Seal. The item "TIMING COVER CHAIN + WATER OIL PUMP 20R 22R NEW Parts For 78-82 TOYOTA 2.2/2.4L" is in sale since Thursday, February 28, 2013. This item is in the category "eBay Motors\Parts & Accessories\Car & Truck Parts\Engines & Components\Timing Components".